You are here: Home / Climate / China urged to take more climate action, so Australia will be "left behind"
China urged to take more climate action, so Australia will be "left behind"
THE Gillard government has always publicly insisted China is taking significant steps to reduce its greenhouse gas emissions, but WikiLeaks cables reveal senior Australian bureaucrats complained privately to China about the ”lack of ambition” in that country’s targets. The 40 to 45 per cent reduction in emissions intensity target was pledged by China at Copenhagen and remains that country’s target. The government’s climate change adviser, Professor Ross Garnaut, judged it to be more than China’s ”fair share” of global emission reductions. Yet another example of a government addicted to spin, that will say one thing to the electorate, and yet believe precisely the opposite in private. Sounds like Algoreshit to me! Can anyone seriously think the emissions of 20 million aussies are anywhere close to 2 Billion chicoms? That’s why the Aussie dude who runs it, and the Corporal who leaked those thousands of docs is in Solitary wearing a bit for 23hrs a day in Fort Leavenworth stockade. Can you Aussies use a slightly brain damaged VP? That would probably be an improvement on what we have currently. At a meeting last night for constituents in Lindsay that I attended, David Bradbury admitted that China is doing nothing in terms of serious emissions reductions programs. The room was full of angry people telling him he will be out of a job next election too. China is laughing its arse off at what western countries are doing to rack up their debts, chase manufacturing into china’s borders and trying to buddy up to them all at the same time. I don’t blame china for taking advantage of the situation, but it would be nice if we could begin the purge our own left wingnuts while there’s still something left in our “modern, developed” countries to work for. Things might be a ever so slightly better here in canada, but I’m not taking anything for granted. Give it another term of the Gillard/Bob Brown government, and Australia will be owned by China anyway. On the matter of climate change and a Carbon Dioxide Tax, Australia is already spending many times more than China does, despite the lies the Gillard government is telling us. This is happening in the US at the same time when the Labor government is asking Bob Brown and Christine Mine to establish the largest largest renewables venture capital fund in the world to pick winners. The biggest financial transaction Bob Brown has ever doen os to decide on a double-espresso or not at a Hobart cafe. 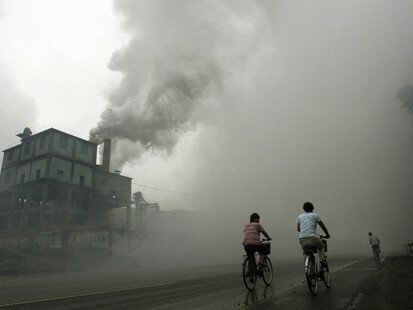 As I understand it, China is showing it’s commitment to AGW by building one coal-fired power station every week. Gillard should walk the walk and institute the obvious sanction of banning coal exports to China. That should ensure that Labor end up needing a mini-bus to take their MPs to Parliament after the next election.